Zhu Di was the Uncle of Zhu Yunwen, who was chosen by Emperor Zhu Yuanzhang as his named Heir. Deposed Zhu Yunwen, the Gongmin Emperor in a short, 4 year civil war. remains an active Miltary Leader riding out on 5 expeditions during his Reign. the apsiring Emperor threatened him with the Death of his family and clan up to the 9Th degree. Another invasion by a Foreign Tribe, the Ching are a Tungusic people native to Manchuria. The Manchu first unite Manchuria, Mongolia and parts of Shandong Province, then establish a parallel Dynasty. When a peasant rebellion sweeps through Hebei and the City of Beijing, Ming Emperor ChongZhen commits suicide. After the rebels reign chaos on the Capital, the Qing armies sweep in to take Victory. Capital City: Beijing, after capture of City and pacification of Beijing from Revolt. Time-line of all 15 Ching Emperors, Life, Love, achievements. 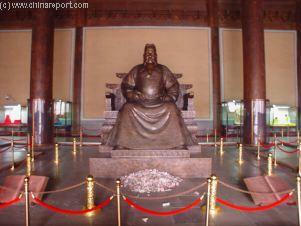 Zhu (朱) Yuanzhang , Name as Emperor (Ming) TaiZu (太祖 ; meaning "Great Forefather of the Ming"). A scale model of Chang Ling, the extensive Mausoleum of Zhu Di Yongle near Beijing. Life December 5, 1337 - July 13, 1402 AD; Death by Suicide, other sources hold that the Emperor disappeared never to be seen again. Folk Tales how the Emperor disguised himself to flee abroad or how he slipped away dressed as a Monk. Zhu (朱) Yunwen , Name as Emperor GongMin (- other sources say no Title as Emperor was given). Eldest son of Zhu Zhanji Emperor XuanDe. As tthe heir apparent named Crown Prince when his father became Emperor. Now returned to the Throne after being a hostage of the Wala Tribe and eliminating the Daizong Emperor. Achievements: The TianShun Reign of the Ming Dynasty After the Míng army defeat at Battle of Tumu and later raids by the Mongols united under a new leader, Altan Khan, the Ming re-adopted an old strategy for dealing with invading tribes, a giant impregnable wall. As a result great reparations and strenghtenings of the Great Wall of China were undertaken. Reign 1573 - 1620 AD , Reign Period Wanli (萬曆) ; translating as "Ten thousand calendars". Reign 1621 - 1627 AD , Reign Period TianQi (天啓) - "Heavenly Opening"
Link: Satellite Image with Schematic of the Location and path of the Great Wall of China during the Ming Dynasty. Passes on the Great Wall included. 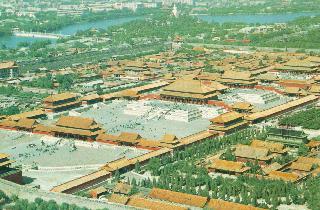 constructed during the 3rd Reign of the Ming Dynasty when the Capital was moved to Beijing. It remains the largest preserved collection of wooden buildings in the world. Chronologic Timeline of Ming Emperors 1368 AD - 1644 AD ; Descendancy of the Ming House explained. SCROLL DOWN FOR FULL TIME-LINE. For a Full Overview and Summary of the Ming Dynasty Period (1368 AD - 1644 AD), please refer to: "Overview History of the Ming Dynasty"
The reinforced protection of the JiaYu Pass and the established Fortress would prove not enough, however. During the Reign of the ZhengDe Emperor of the Ming Dynasty war broke out with forces from the City of Turpan, now a part of Xinjiang-Uygur Autonomous Region. During this Era the opposition from Turpan was strong and the JiaYuGuan Fortress, a remote outpost, was repeatedly conquered and JiaYuGuan City pillaged. It took a 160+ years until 1539 AD before the full defenses of the Pass were complete with the addition of the Suspended Arm Great Wall of China, after which no more invasions occured through the JiaYu Pass. Yuanzhang the Hongwu Emperor, the Confucian scholar gentry, marginalized under the Yuan for nearly a century and mistrusted and suppressed by the first Emperor, once again assumed their predominant role in running the empire. Among things the strong confucian influence at court has been reflected in the layout and architecture of one of the Ming's finest Monuments, the Ming Dynasty Mausoleum Valley outside being. Some of the best preserved examples of confucian stone sculpting can be found flanking the spirit way, and adorning the White Marble LingXing Gate, both on the route leading to the heart of the Valley. were linked. Both groups were working against the interests of the neo-Confucian sensibilities of the scholarly elite. Religious lobbies encouraged commercialism and exploration, which benefited commercial interests. However they did this not so much of interest for the explorations, but mainly in order to divert state funds, which could then not become available from the anti-clerical efforts of the Confucian scholar gentry. 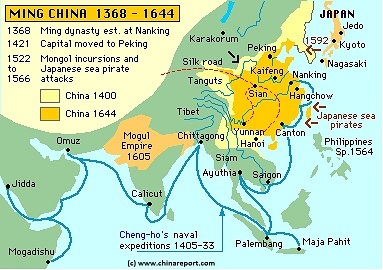 Achievements : The Yongle reign of the Ming Dynasty had its achievements. Revision of the City of Beijing, who's monuments still stand as a tribute to the vision of the early Ming Dynasty. Zheng He tribute- and peace-missions, reaching the Coast of East Africa, establishing new Trade Routes, making available new spices and goods and stimulating new maritime inventions. Grand restorations of the Great Wall of China after thoroughly establishing Capital at the now expanded city of Beijing. Compiling "The great encyclopedia of the Reign of Yongle", the first and most comprehensive encyclopedia in Chinese History. Water conservation projects, encouraged agriculture and stimulated the handicrafts industry. The entire Chinese canal system was reviewed and reconstructed between 1411 and 1415 during the reign of Zhu Di, the Yongle Emperor. 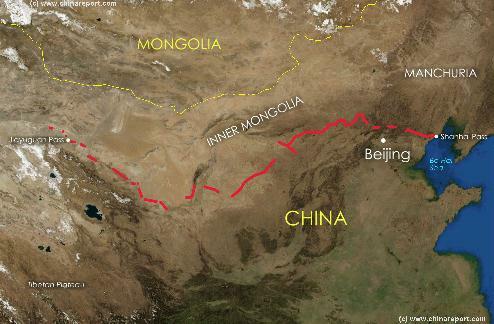 The resulting Grand Canal of China would connect the Capital of Beijing with the City of Huangzhou in the lower reaches of the Yangtze River, creating the longest artificial river in world history. unique examples of early Chinese architecture and stone masonry. Emperor abandoned his doubts about his succession and Zhu Gaochi remained Crown Prince. 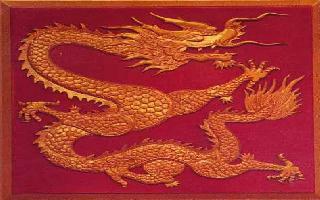 When in 1424 AD Zhu Di Emperor Yongle died, his eldest Son Zhu Gaochi thus succeeded to the Dragon Throne.